I love the “pomodoro” technique of time management. It helps me to stay focused and feel good during the workday. If you’ve never heard of it — in a clamshell — the pomodoro technique advocates working in 25 minute sprints with 5 minute breaks. You can find more about it here! Until recently, my first pomodoro of the day usually goes like clockwork. I dutifully set my phone by my desk, open up my favorite pomodoro app and click start. The time flies, my work gets done and before I know it — it’s time for the first break. It will usually be another 10 minutes before I realize the button on the pomodoro timer hasn’t been pressed. Ack! Again?! What to do now? Can’t edit the timer, so forget the timer. Start watching the clock? Start late? It doesn’t really matter, because either way I feel bad! I may have gotten a zillion to-do items done, but I failed on my simplest plan! And just like that, my sense of accomplishment—withered on the vine. So here’s what’s been working for me lately: hardcoding all of my pomodoros into a Google Calendar. That way, a pop-up notification actually freezes my browser until I hit the ‘ok’ button—so I take those health-inducing 5 minute breaks, and I don’t hit ‘ok’ and unfreeze my browser until my mini-breaktime is over. Suddenly I’m on track, taking care of myself, getting things done, and as James Brown said it best, I feel good! If you are doing 25 minute pomodoros with a 5 minute break, schedule a 30 minute appointment with a 5-minute reminder pop-up. The calendar tab must remain open in order to work. If you are new to Google Calendar and pomodoro, you might want to start with the traditional simple kitchen timer or one of the many pomodoro apps. By doing it the Google Calendar way, you do miss out on some of the habit-building cues that a real tomato timer can build such as the winding and the ticking and ringing. 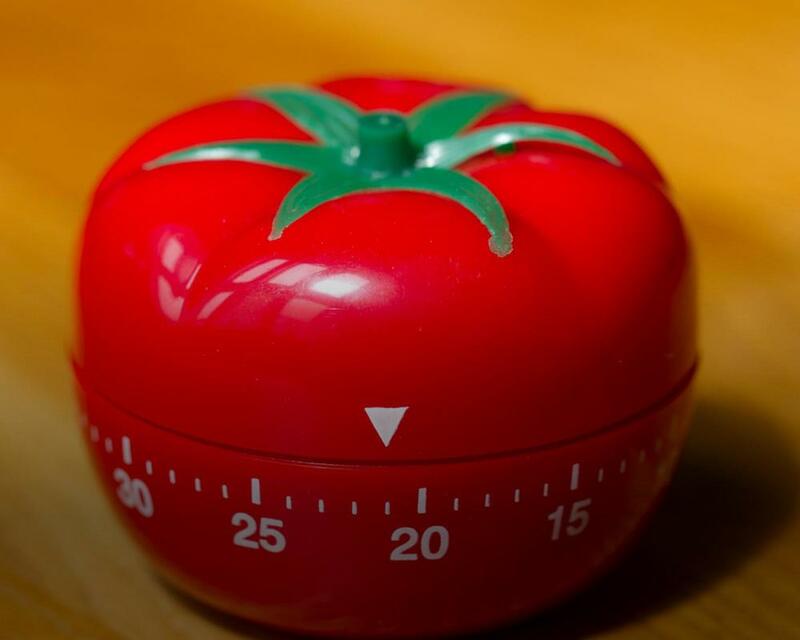 In any case, if you miss the start of your pomodoro, don’t worry about it. Just pick it up and let it roll. Besides encouraging the healthy habit of taking regular, short breaks, the other great benefit I find from scheduling pomodoros into my workdays is that I don’t think about the time at all. I don’t spend any energy managing work blocks and instead spend more time just getting things done. Do you have an alternative “pomodoro” technique that works for you? If so, I would love to hear about it in the comments!